Starting fall 2018, NC State gained access to IBM Q commercial quantum computing devices, including the most advanced and scalable universal systems available. The current 20 qubit IBM Q system will be followed by a next generation 50 qubit prototype, anticipated in 2019. NC State students, faculty and staff interested in accessing the IBM Q Hub at NC State may request access by filling out the form at the below link. Are you an NC State student, faculty or staff member interested in quantum computing? Access resources by visiting the below link. We are in the process of hiring a Postdoctoral Research Scholar. Scientists prove a quantum computing advantage over classical. NC State is the first university-based IBM Q Hub in North America. 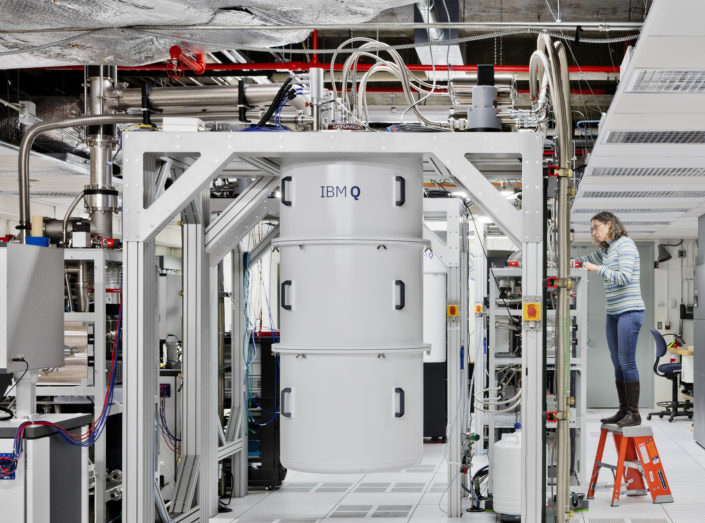 IBM Q Hubs are part of a worldwide community of leading Fortune 500 companies, startups, academic institutions, and national research labs working with IBM to advance quantum computing. A look inside an IBM Q quantum computation center. Photo by Connie Zhou for IBM. Quantum computers are incredibly powerful machines that take a new approach to processing information using the principles of quantum mechanics. There are currently problems that classic computers can’t solve. These generally involve exponential scaling such as large-scale optimization or chemistry simulations. Quantum computers are being built to work with classical computers to solve these problems. IBM Q is an industry-first initiative to build commercially available universal quantum computers for business and science. IBM is rapidly driving scientific advancements and discovery in improving the functionality of quantum computers and realizing quantum’s potential to solve some of today’s unsolvable problems in areas such as chemistry, machine learning and optimization.